Although I was born and raised in Brooklyn, my family hails from the south. Virginia, Georgia and The Carolinas. So I was raised on Soul Food. I may not eat it as much as I used to since a lot of the dishes can be fattening (when made traditionally). But it’s still my favorite cuisine. Ain’t nothing like some Southern Style Potato Salad. You won’t find no raisins in here. 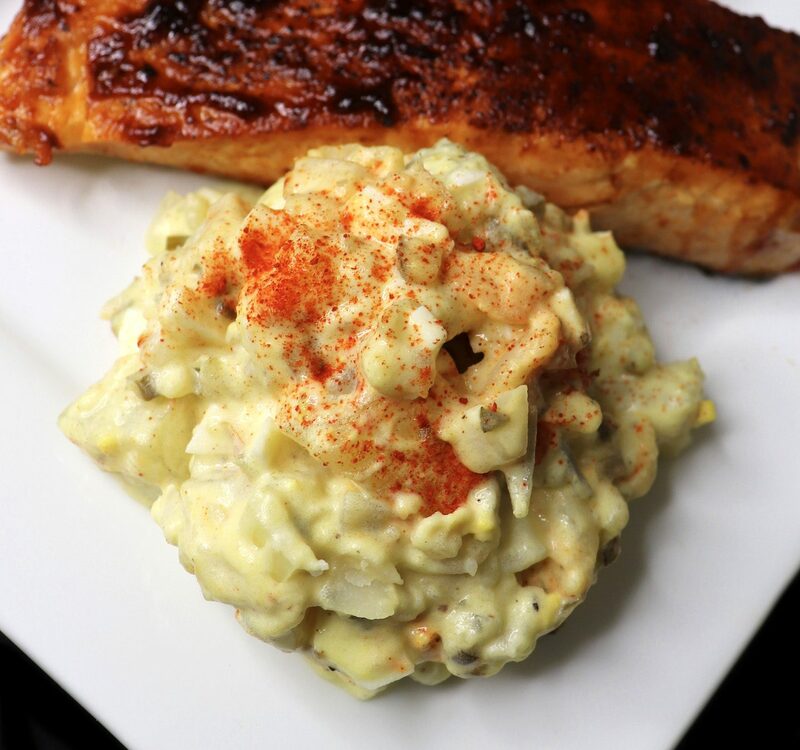 Growing up, there was never a barbecue or holiday that didn’t include some potato salad. 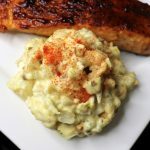 So I was inspired to pair my Southern Style Potato Salad with some Spicy BBQ Salmon. Oh, and some greens. You can’t have potato salad without greens, so I made some sautéed kale as well. I’m a pescatarian. So expect to see a lot of seafood alongside vegetarian dishes. The potato salad is vegetarian friendly (if you eat eggs). Feel free to substitute the salmon with a protein of choice (tempeh would be good). Anyway, here’s all of the recipes so you can make this entire meal. Thank me later. Some good ol’ country potato salad. No raisins involved. To prepare the potato salad, peel and cube the potatoes, then boil for about fifteen minutes until tender. You can boil the eggs in the same pot as the potatoes. Chop the onion while you wait for the potatoes and eggs to cook. Pour the potatoes into a colander, rinse with cold water and allow to drain. Chop the eggs. In a large mixing bowl, add the potatoes, boiled eggs, onions, sweet relish, mayo and mustard. Season to taste with salt & black pepper. Mix thoroughly. Flatten out the top, garnish with smoked paprika, cover and chill until serving time. Wash and chop the kale. You can buy the pre-chopped bagged variety to make things easier. Make sure you wash and drain still. Heat the olive oil in a wok or saute pan, then add the kale. Saute until tender. Add the apple cider vinegar and hot sauce, and season to taste with smoked paprika, salt & pepper. Turn off the heat. Wash the salmon with lemon juice and water, and pat dry. Season with the Slap Ya Mama (or seasoning of choice). Set aside. In a small bowl, mix the bbq sauce with the brown sugar and sriracha sauce. Set aside. Heat a cast iron skillet or non stick pan, and add the olive oil. When the oil is hot, add the salmon fillets. Cook for a minute on each side. Glaze with the spicy bbq sauce, then cook further for 1-2 minutes on each side. Plate the salmon, kale & potato salad. Enjoy. 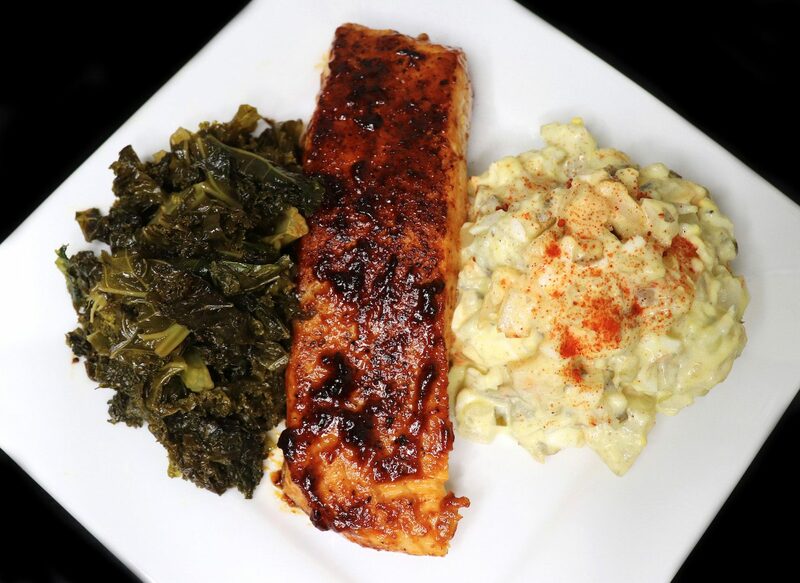 Southern Style Potato Salad served with Sweet n’ Spicy BBQ Salmon & Sautéed Kale. I season my food to taste. So feel free to adjust the ingredients according to your own taste.